There are millions of compartments that, together, make up the magnificent, multifaceted train of Art and design. It billows along, without a second glace at those, attempting to jump aboard. If you are one of them, we are here to help! Here, is a bit of insight into two of the world’s most popular art movements from the early 20th century – Art Nouveau and Art Deco. Left (up to down): Gia Chandelier. Web Mirror. McQueen Wall Lamp. Philosophy: Let beauty be the standard, nothing is too utilitarian to be stylistically interpreted. Can be applied to elements of everyday life – paintings, utilitarian objects, jewellery, clothes, architecture, furniture and lighting – visual, decorative and applied art. Telling elements: Decorative down to its core, with stylistic floral/tendril depictions and swirling patterns (Flowers, stems, leaves, hair). Ornamental with curvaceous, feminine lines, heavily patterned with a flat, 2D appearance. Furnishings and lighting: A stated preference for sculpted wood and wood floors, combined with stained glass, ivory inlays, stucco floral décor and wrought-iron tendril bannisters is apparent. The iconic Tiffany lamps were a standard, alongside lighting fixtures with botanical shapes manipulated into their shades and suspension. Colours: Primarily warm hues seen here, cooler tones are used sparingly only to highlight the softer, warm colours. Think muted yellows, earthy browns, lilac, fleshy off-white, with brass and bronze bases. Almost any colour can be incorporated, but in low saturation, setting a magnificent but dream-like aura in the room. Art Nouveau Today: This revolutionary movement ran out of style pretty quick, deemed too extravagant and horrendously pricey to create, it couldn’t last the test of time. In modern homes, hotels and other interiors, one generally finds a more contemporary interpretation of ‘what used to be’. A floral wallpaper reminiscent here, those petal-like shades on your pendant lamp or even carpets with simplistic floral patterns. 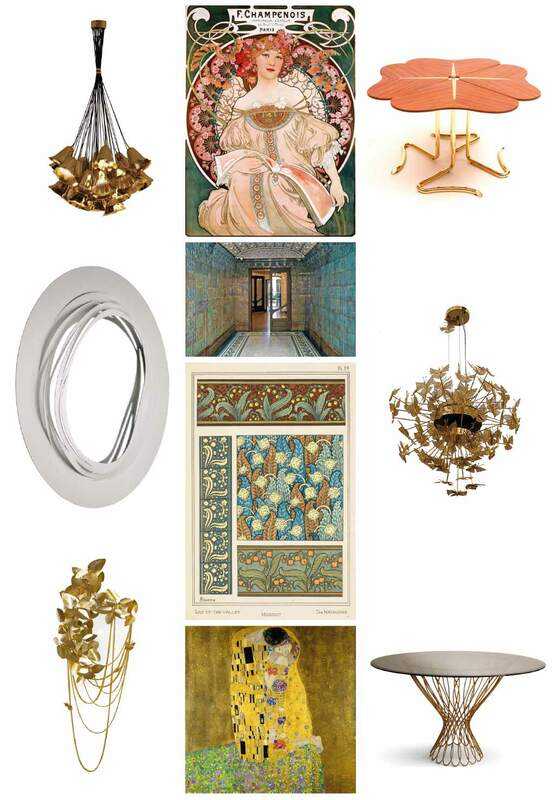 Nobody wants too much of it – but Art Nouveau, in small doses, combined with sleeker, modern furniture, is here to stay. Philosophy: Opulence reflected in the boom of modern technological advances. Was a major influence on architecture and interior design, along with fashion, jewellery, and poster design. It was incorporated into visual art on a smaller scale. 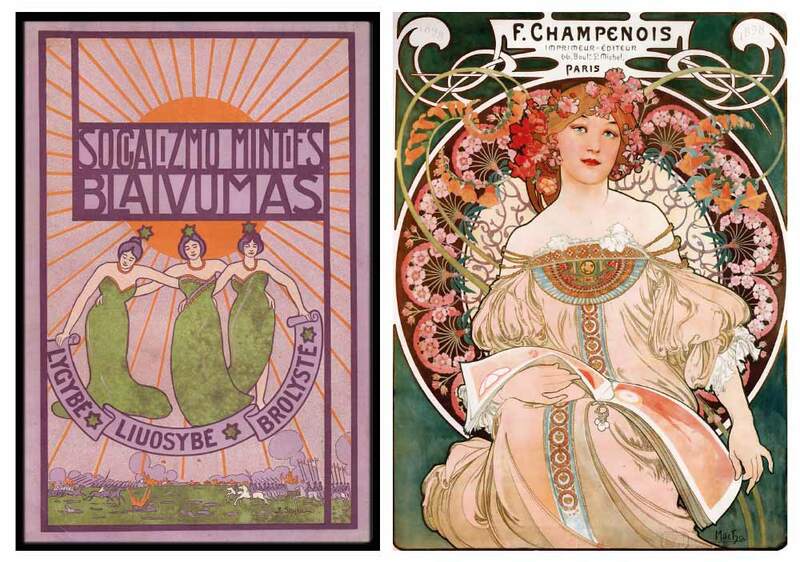 Telling elements: Repetitive geometric patterns and straight lines where Art Nouveau used sinuous. Rectilinear designs, triangular shapes, chevron (zig-zag patterns) and finally, sun-burst motifs to signal the hope of better things to come. Furnishings and lighting: Bringing out more industrial elements in aluminium, stainless steel and plastic, we see utilization of wood at par with metal. Flooring is done in wood while the upholstery was adorned with rhythmic, geometric patterns in two contrasting tones (not exclusively mind you). Lighting styles are layered, with light fixtures found a-plenty, illuminating rooms in indulgent luxury. Modern pendant lights were a huge hit, along with sleek glass bowls. Colours: Lots of industrial colours in stark black, white and metallic shades (gold, silver, copper). Neutral browns, off-white and beiges are another prevailing palette with a mass of rich, eye-catching jade, corals, reds and oranges sprinkled in between. Art Deco Today: The Art Deco movement slumped by the end of the 30’s, keeping time with the arrival of World War II. It had a way of resurfacing time and again, in the 60’s, through the medium of Pop art and again in the 80’s, when graphic design began gaining momentum. Very much prevalent today, it was popularized by the extravagant sets of Baz Luhrman’s ‘The Great Gatsby’, based on the eponymous novel, set during the ‘roaring 20’s’. The prominence of the Chevron pattern, just last year, is another nod in that direction, along with symmetrical room arrangements and a love for jazzy metallic or patterned cushions, sheets and other soft furnishings. Not to revert back to showy, overt displays, Art Deco is now visible in modern homes at an understated level. 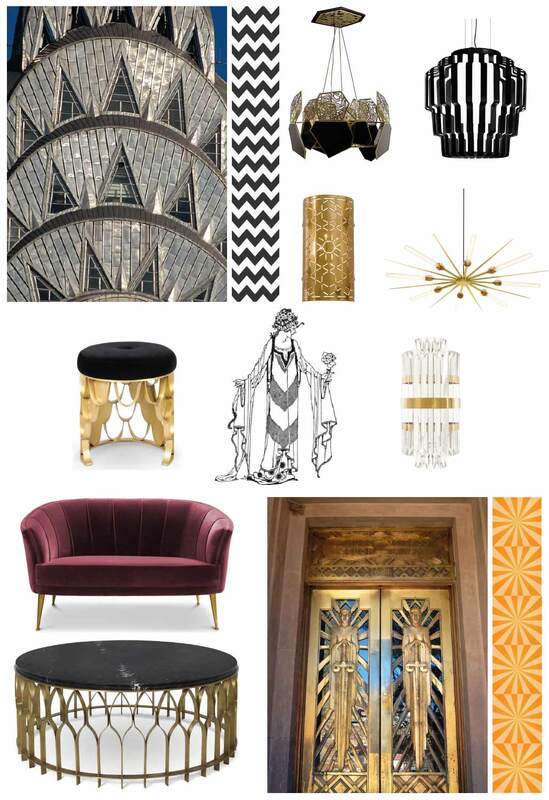 This entry was posted in Inspiration and tagged Art Deco, Art Nouveau.